Anniston, Alabama is the county seat of Calhoun County with a population of more than 23,000 residents. Anniston is one of two urban center/principal cities included in the Anniston-Oxford Metropolitan area. The city is situated on the slope of Blue Mountain and is directly off Interstate 20. Though the surrounding area was settled much earlier, the mineral resources in the area of Anniston were not exploited until the Civil War. It was not until 1917 that the U.S. Army established a training camp at Fort McClellan at the start of World War I. On the other side of town, the Anniston Army Depot opened during World War II as a major weapons storage and maintenance site. A role it continues to serve as munitions-incinerations progresses. The Army closed Fort McClellan in 1999. Anniston has a storied cultural history, having been the birthplace of the Alabama Shakespeare Festival in 1972. The Festival remained there until moving to Montgomery in 1985. The city is also home to the Knox Concert Series, an annual season of noted musical and dance productions as well as the Community Actors’ Studio Theatre- a community theatre organization that performs plays, musicals and reviews featuring local performers. Anniston is home to the incredible Anniston Museum of Natural History as well as the impressive Berman Museum of world History. Anniston's school system boasts one of the most high-tech computing capabilities in the state. In terms of higher education, Jacksonville State University is located only 12 miles north in Jacksonville. And Anniston is home to satellite campuses of Gadsden State Community College. According to the Alabama Transportation Director, there were 3,469 crashes in Calhoun County in 2012. Of these accidents, 1,233 resulted in non-fatal injuries and eight resulted in fatalities. In the City of Anniston, there were 1,221 crashes, which included 445 non-fatal injuries, and one fatality. These statistics underscore the potential for anyone driving through the Anniston-Oxford area to be involved in a serious motor vehicle incident. 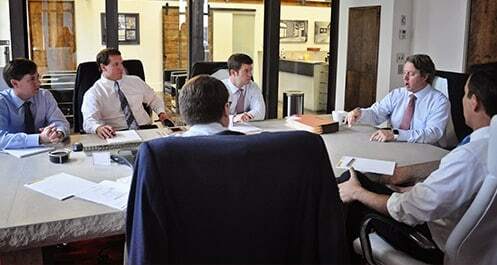 The Anniston car accident attorneys at Hollis, Wright, Clay & Vail, P.C. are just minutes away in Birmingham and routinely represent individuals and families that were injured or victimized by an automobile accident in the Anniston area. Our attorneys frequently appear in the Circuit Courts of Calhoun County located at the corner of 11th Street and Gurnee Avenue. Our attorneys have participated in bench trials and jury trials in the Circuit Courts of Calhoun County and are incredibly familiar with the judges and the community. Our attorneys will devote the energy, resources and time to obtain the compensation to which you and your family are entitled as a result of the injuries and losses sustained in an accident. If you or a family member has been hurt or killed in a car accident in Anniston that was caused by another driver, then the laws in the State of Alabama allow you to be compensated and claim damages including lost wages, medical bills, emotional distress and pain and suffering. If you were permanently injured or scarred, then you can claim compensation for that element of damage also. In order to vastly improve your chances of a good recovery from the insurance company for the at-fault driver, it is vital that you take the necessary steps immediately following an accident to protect your rights. After receiving medical care, you should get in contact with and hire a good, competent attorney that has the knowledge and expertise to handle these types of cases. You should not settle for just any attorney. Rather, you should research the attorneys in your area and hire one that has the resources and experience to help you in your time of need. The Anniston car accident attorneys at Hollis, Wright, Clay & Vail, P.C have decades of experience and a proven record of success in handling motor vehicle accident cases. Our attorneys carefully review each and every car wreck case with a high degree of care and concern all in an effort to identify and pursue compensation for all aspects of the injuries you or a loved one sustained in an accident. If you have been injured in an accident that occurred in Anniston, Alabama, please contact us now at 1-844-529-8255 for a completely free and confidential consultation. If you hire our firm, we will handle your case on a contingency fee agreement which means that we don’t get paid unless we are successful in recovering money for you.